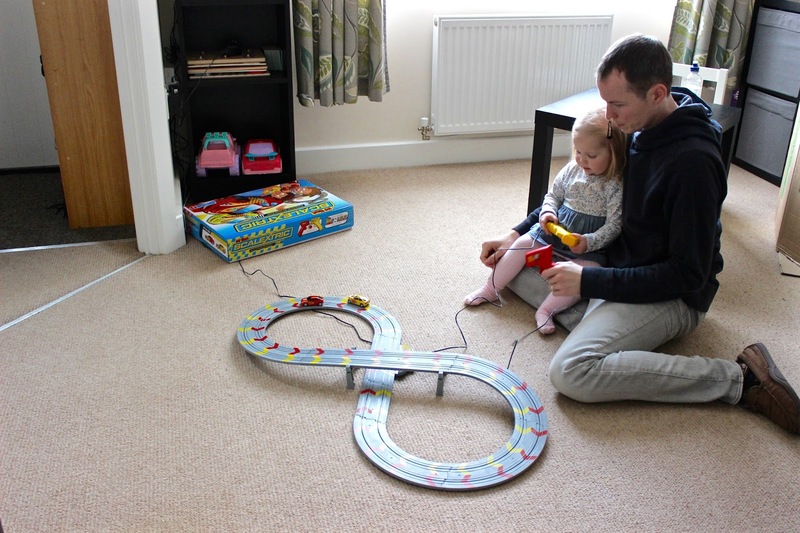 I think it is every Dad's dream to introduce their children to Scalextric. I know that my husband gravitates towards the Scalextric anytime we visit a toy store! 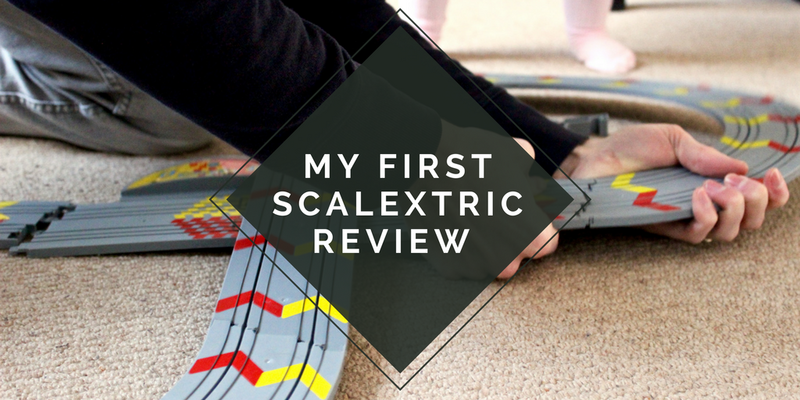 When Scalextric offered to send us "My First Scalextric" for Elise to test out, I think that my husband was secretly quite excited. In fact as soon as it arrived, he couldn't wait to get it open and show Elise his mad Scalextric skills. 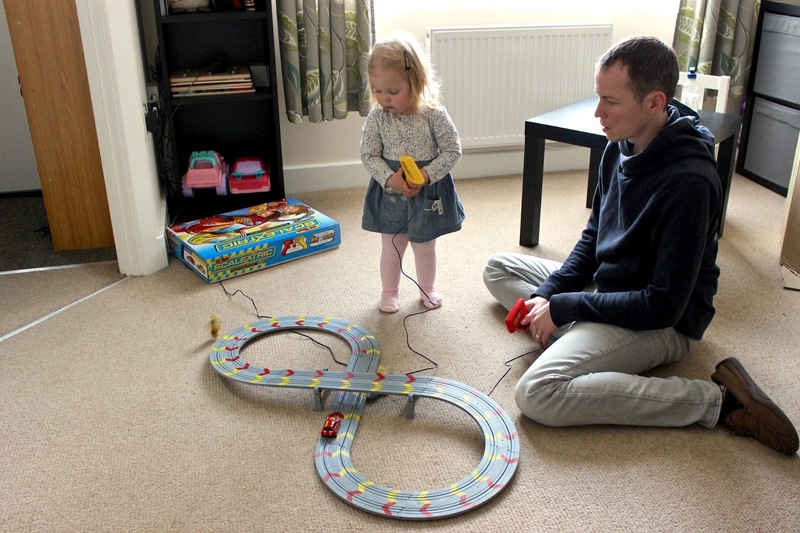 My First Scalextric retails for £39.99 and is aimed at children aged 3+, although with supervision and guidance Elise was able to join in the fun and didn't find using the controller very difficult once she knew what to do. The set includes a a track that clicks together to form a figure of 8 shape (with a raised section), 2 super resistant cars, 2 speed limiter hand controllers, power supply and accessories. The set comes with two coloured cars, a red one, and a yellow one which colour coordinate with arrows on the track. The controllers have a speed limiter on them for younger children to help prevent the cars going off the track (although we didn't use this as we feel part of the fun is the cars flying off the track when you get too excited). The controllers are plugged into the track, and need to be plugged into a mains switch. The cable isn't of great length, so you do need to make sure that the Scalextric isn't too far away from the plug socket. My First Scalextric is compatible with any of the Micro Scalextric Range so as your child grows you can add more pieces onto the set. As soon as Elise saw the set she was very excited and wanted to get involved. Elise loves anything to do with vehicles thanks to her dad who is a Motorbike Design Engineer. She also loved pointing out that the cars were red and yellow and wanted to try out both colours. She quickly worked out that the cars needed to go on the track, and after a few attempts she was able to put them in the tracks. Once the track was set up, which didn't take very long although some of the pieces were a bit tough as the set was new, Elise picked the car that she wanted to be (Yellow) and off they went. 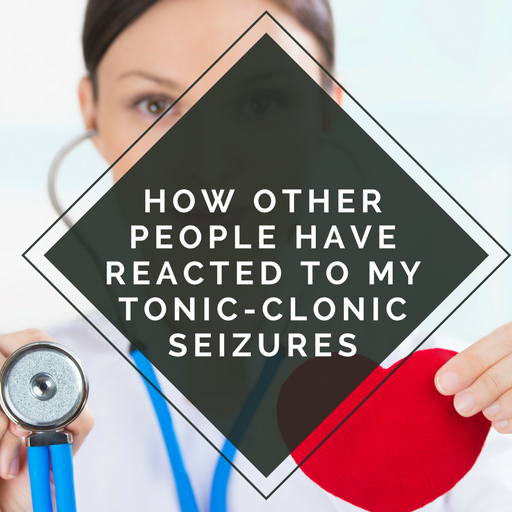 At first she just watched the red car go around the track, and at some points she thought that she was controlling that car. Once we explained that the controller matched the colour of the car she started to understand how to play. 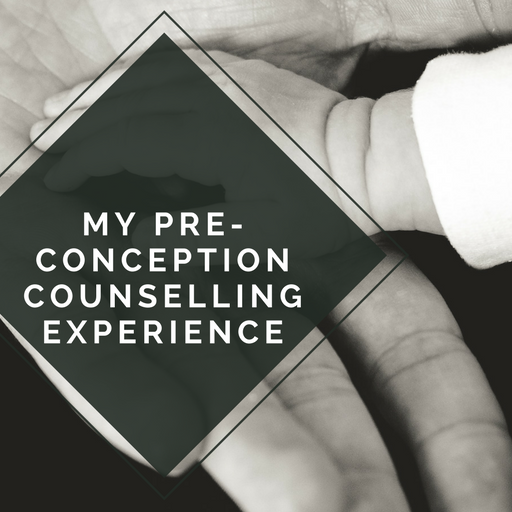 She loved pushing down the trigger, and although her hands are too small to hold the controller properly, she held it in her lap and pushed it with her thumb. It wasn't too hard for her to push down although she did push it in bursts rather than holding it down. As Elise is only 2 she didn't really understand the racing element and who was winning the race. She just had fun watching the cars go round the track. She didn't get upset when the cars flew off the track, she just went "Oh No" and then put the car back on the track. 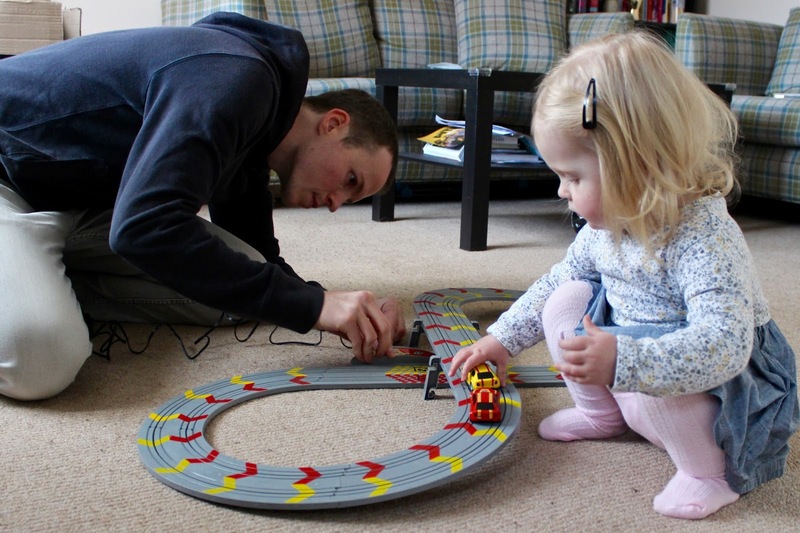 It was a great bonding time for us all, and she loved sitting on our laps whilst we played with the Scalextric set. I can see us playing with it lots in the future. I'd recommend setting it up when your little one isn't present if they are around Elise's age though as she became a little bit impatient. Also I'd love to see the controllers become wireless for younger players as she wanted to walk around and follow her car. We found that the wires for the controllers kept going over the track and stopped the cars working. This is something that she will learn though. 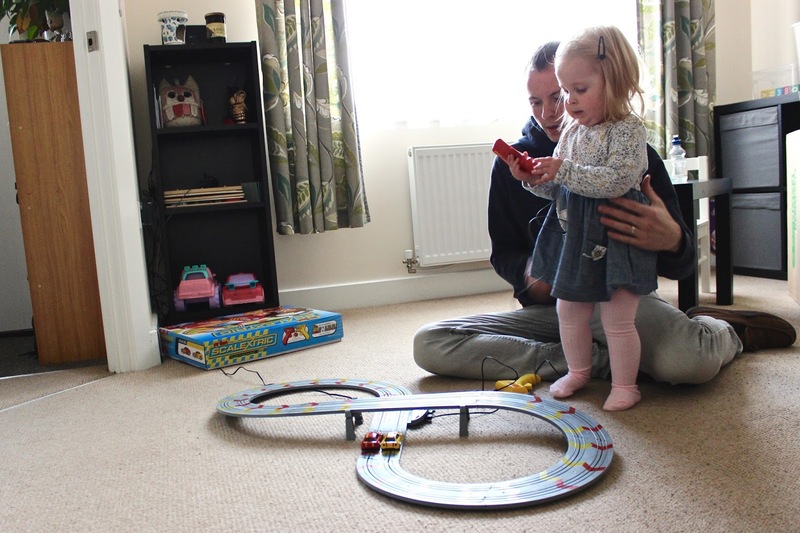 We love My First Scalextric and feel that Elise will enjoy it as she grows up. 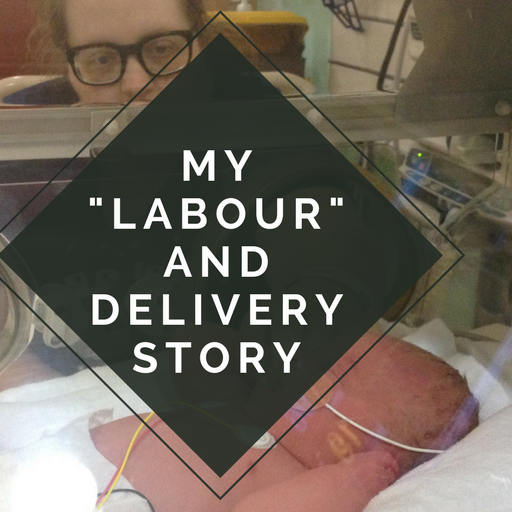 Although she doesn't quite understand all aspects at the moment, it is a great family activity. 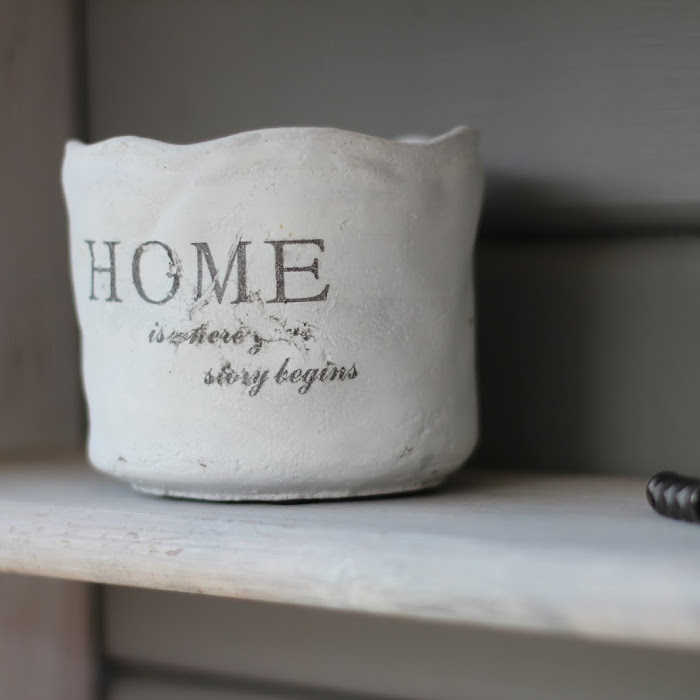 We always love spending time together as a family so it gets the thumbs up from us. As I mentioned before, as it is aimed at young children, wireless controllers would be a great addition. Also we found that some sections of the track were hard to get together so I would worry that they would snap as we had to force them together a little bit. Apart from this though, we would recommend this product. 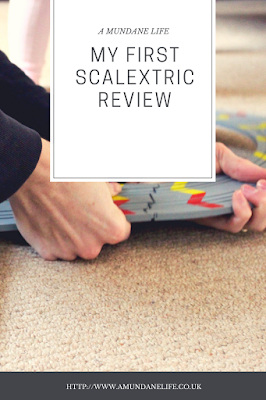 You can purchase your own My First Scalextric from any good toy store, Amazon or from the Scalextric website.